Our bamboo slat collection begins with commercial grade Moso bamboo. Milled on the back and sides for side by side installations. Please note colors may vary. 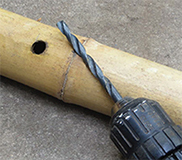 Learn to cut bamboo, drill, bend and much more usefull tips and ideas. Learn how to build a gorgeous room divider or make a memorable wedding arch. A fully trimmed natural bamboo wall covering in your home would make for the perfect accent where a unique and contemporary design is desired. 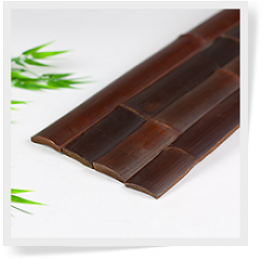 Bamboo slats get processed from bamboo shoots and can be made into beautiful pieces for the home including; ceilings, walls, trim, support posts, bars and more. This strong, natural and eco-friendly resource needs to be given more credit as it could one day prevent and solve global warming. Because they have a flat edge, bamboo slats are perfect for covering ceilings, walls and many other spaces surrounding the home. They are easy to install and come in various dimensions and sizes which makes every type of home decor and trimming project easy to finish and maintain. You can find bamboo slats online for wholesale prices, with fast and free delivery options on many bamboo products and sizes. Bamboo slats are sustainable, versatile and durable as well as low maintenance. Bamboo slats are uniform in size and are perfect to use for any home design project, particularly trim and facing. They can easily be cut with a saw blade and if applied with a sealant, they can last for decades without any kind of maintenance or intervention required. If you have ever desired to have a tropical, island and tiki feeling to your home, maybe now it’s the perfect time to start. That tiki bar can be made in just a few simple steps using some of these natural bamboo slats. Art Pieces and Decor: you can paint bamboo slats and cut them to fit any type of art or decor project like a mirror, divider or office art piece. Blinds: bamboo blinds made up of slats are lightweight, easy to clean and install and are durable and long-lasting. 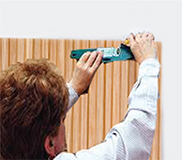 Trim: Bamboo slats can be purchased in bulk online in many different sizes and colors and be used as a great alternative to wood window and door trim for around the house. Facing: Bamboo slats can be made to fit ceilings and walls as the perfect natural yet modern wainscoting accent to any room. Bamboo is a never ending renewable and sustainable resource. It’s one of the fastest growing plants on the planet and can be harvested more quickly (every 3-5 years) than compared to wood which takes on average 30-50 years (quite a difference!). Its fast and simple generation properties allow us to continuously harvest it without the damages of deforestation. Bamboo is also extremely lightweight compared to our average hardwoods so it makes the transportation process easier, less expensive and requires less chemicals during manufacturing and shipping practices (another benefit to reducing chemicals in our environment). Its strength and versatility make it a great building material that is durable and long lasting. Bamboo is a very eco-friendly and sustainable resource commonly used in North American homes today. If we all used bamboo to its full potential, we could help eliminate global warming altogether. There are many advantages of using bamboo slats in the home. They come in a variety of styles and colors and are durable and easy to maintain. They are eco-friendly, can be easily cut and installed and can provide a comfortable earthy natural feel to any home. Bamboo slats can be used for a variety of things around the home including, art pieces, dividers, tiki bars, trim and facing. Its natural properties make it an appealing and lovable addition to any home for many years to come. 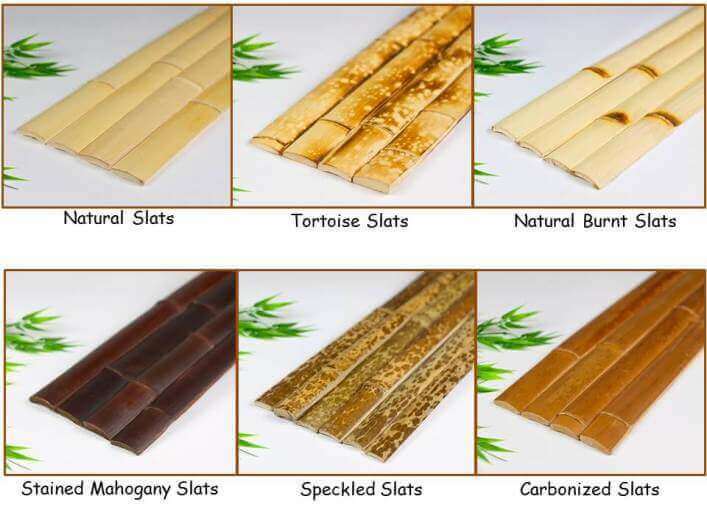 The main color choices for bamboo slats are: natural, tortoise, natural burnt, mahogany, carbonized and speckled. 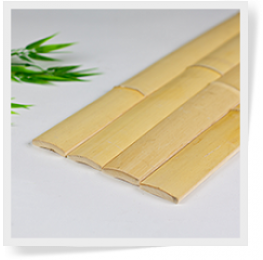 Natural Bamboo Slats - Natural bamboo slats come in a natural, light tan like appearance in a variety of sizes. They can be cut or painted to fit perfectly into any home design project or art decor. You can buy them wholesale and there are options for free delivery. 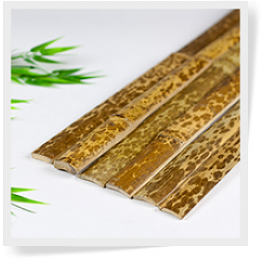 Tortoise Bamboo Slats - Tortoise bamboo slats are similar to natural bamboo slats but they have a matching appearance to a tortoise shell. These rare and unique bamboo slats make it highly desired and ornamental. We offer tortoise bamboo slats for great prices and have them delivered right to your door quickly. 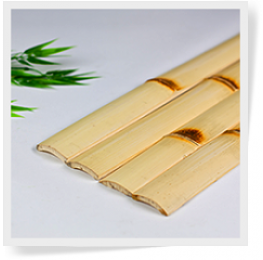 Natural Burnt Bamboo Slats - Natural burnt bamboo slats are made up of high quality bamboo that has been tested to ensure longevity. Its pattern is a little bit different as the edges or seams of the bamboo look like they’ve been burnt. They are popularly used for tiki bar faces, wall trim, frames and wainscoting. Buy them wholesale for great low prices and receive free delivery. 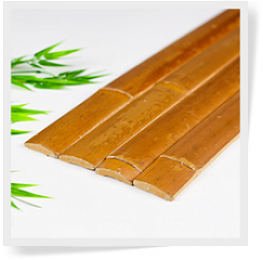 Mahogany Bamboo Slats - Mahogany bamboo slats are similar to natural bamboo slats, but they are dyed or stained in a mahogany color. This color of bamboo makes it a wonderful addition to any contemporary and modern home decor. You can use mahogany bamboo slats as wall trim, ceiling trim and even as a replacement to baseboard. 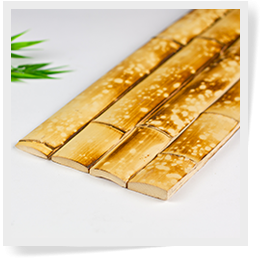 Carbonized Bamboo Slats - Carbonized bamboo slats go through a smoking process during manufacturing and come out with amber colors and darker accents around the nodes and seams. They blend well with any style of home decor and are versatile and durable. Buy them by the dozen, or buy them in a bigger load, there are many options available. Speckled Bamboo Slats - The uniqueness of speckled bamboo makes for interesting home decor options. It’s long lasting, durable and easy to install so it would even be great to use for wall trim and wainscoting or home blinds. Speckled bamboo slats can be shipped quickly in bulk and come in a variety of different sizes to suit your project needs. Natural Black Bamboo Slats - Natural black bamboo slats have all of the benefits of the traditional natural slats along with a modern, contemporary appearance. Attentively constructed to feature a refined look, they can be conformed into flooring, fencing, and many outdoor structures. 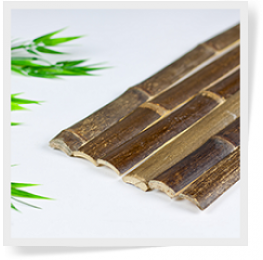 Natural black bamboo is one of the rarest bamboos on earth that you now have full access to enjoy.